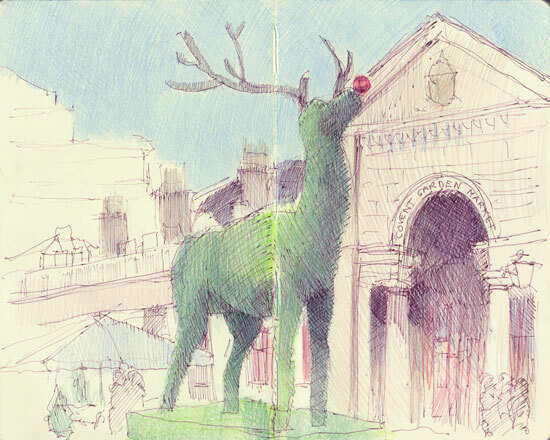 Travels with a Sketchbook in...: Giant red nosed reindeer in Covent Garden! Giant red nosed reindeer in Covent Garden! 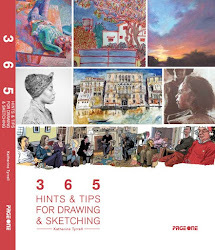 Yesterday was the last outing of 2010 with the Drawing London group. We went to Covent Garden for the morning before having a lovely Christmas lunch. 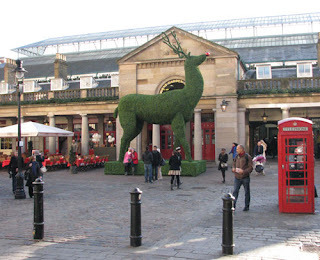 The big surprise for me was finding that an extremely large red nosed reindeer had landed in the Covent Garden Piazza! This one was really big and green! It was too cold to stay still for long so this sketch only took me about 15 minutes. However I think it gives the stong sense of just how big this reindeer actually is (see right for photograph of it). I couldn't work out what it was made from but it seems to be some sort of articificial foliage wrapped around a skeletal structure which was most impressive. Apparently real life reindeer petting for kids is taking place every Saturday in Covent Garden Piazza! Covent Garden is the site of the former fruit and vegetable market in central London which has featured in many paintings over the years (see Townscape: Covent Garden Market). 600 AD: the land was and settled and became the heart of the Anglo-Saxon trading town of Lundenwic. Excavations show that the settlement covered about 600,000 square metres, stretching from the present-day National Gallery site in the west to Aldwych in the east, and was laid out on a grid pattern. Lundenwic in the early eighth century was described by the Venerable Bede as "a trading centre for many nations who visit it by land and sea". 830 AD onwards: The Vikings invaded and raided the settlement and apparently it was subsequently abandoned by the Saxons. 886: captured by the forces of King Alfred the Great of Wessex and reincorporated into Mercia. This was the point at which the main focus of the City of London moved east. The old settlement of Lundenwic became known as the ealdwic or "old settlement", a name which survives today as Aldwych. 1974: Covent Garden Market relocated to New Covent Garden Market at Nine Elms. 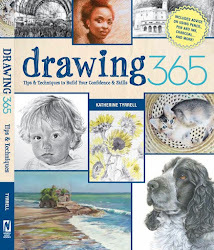 Lovely sketch, Katherine! Your pen lines give it a nice texture too. He does look very proud of himself! 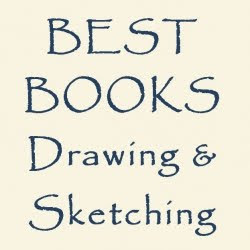 Wonderful sketch of the huge beast. What fun! I have fond memories of Covent Garden. Well spotted Jeanette! Now corrected. Can you tell I've been planning ahead and have had calendar dates going round and round in my noddle! 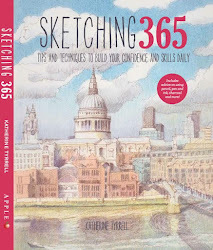 Delightful sketch! It looks sunny but I can't help thinking it must have been freezing. Delightful sketch. It looks sunny but I can't help thinking you must have been freezing. Very sunny and very cold. I boasted five layers and still couldn't stand still for long! I love visiting Covent Garden as you never know what you will encounter, I've never seen a reindeer though.